…were they frozen, starved or suffocated? SMITH SOUND, NFLD. - Thousands of dead cod turned up off Smith Sound Trinity Bay, Newfoundland this weekend. Fishermen noticed small numbers of dead cod earlier in the week and by Saturday the bay was full. Fishermen estimate that about a quarter-million pounds of cod have died. Tom Mills, a Smith Sound resident, described the cod as flawless, "with no signs that they were killed by seals or pollutants." Mills estimates the cod surfaced over a 25-kilometre area and predicts the final loss to reach thousands of tonnes, which will likely have a disastrous impact on the vulnerable east coast fishery. Each year, small numbers of cod surface due to 'super chilling', an atmospheric affect that draws cod to a body of water that's too cold for them to survive, and they eventually freeze to death. Provincial authorities are unsure what caused this latest tragedy and have cautioned people not to eat the cod until test results come in. But residents of Smith Sound are taking to the waters and scooping up as much cod as they can store, despite the do-not-eat warning. How sad. Has the saga of the troubled northern cod now come full circle? Five hundred years ago it was claimed that one could harvest cod from Newfoundland waters simply by lowering a basket into the sea. In this latest pathetic twist of the story, it seems that harvesting the northern cod might again be that easy…because thousands of tons of them are floating dead on the surface of an inshore bay. The scientific opinion is that these cod have died from the cold. But that explanation at first sounds just a bit unlikely. Have not Newfoundland waters always been very cold? The cod population involved in this incident represents the last hold out of a once-phenomenal biomass that dominated the entire Grand Bank. And it now seems certain that cod will be unable to survive much longer in this precarious position. Why not? Frozen cod at Lower Lance Cove, Newfoundland, April 9/03. Why did the cod die? Stresses have been mounting on the northern cod that indicate that the marine environment has become increasingly hostile to its continued survival. But this does not mean simply that the ocean has become colder. A more plausible explanation is that the many shifting trends have been forced by an ever-dwindling food supply. Surviving northern cod are now increasingly concentrated in a few inshore bays (FRCC, DFO). This is in marked contrast to the earlier, long-established pattern where the bulk of the cod population migrated offshore to spend the winter in warmer, deeper water and moved inshore during the spring and summer months to feed. Cod that live inshore year-round enjoy a relatively greater availability of food, but they run the added risk of becoming weakened or killed by exposure to extremely cold (sub-zero) surface water. The water has not gotten colder, but it appears that a greater proportion of the cod are trying to survive in this precarious position. What is essentially a food shortage issue for cod could therefore be ultimately manifested as a ‘freezing to death’ issue. There are many other indications that food shortage is now a major problem facing northern cod. - Growth rates, and more significantly the condition (essentially the fat content), of cod has declined in recent years, and this decline has been sharpest in the areas with lower natural levels of food production (i.e. offshore Newfoundland waters as compared to inshore, and in Nova Scotia a marked drop in condition has occurred on the Eastern Scotian Shelf as compared to the richer Bay of Fundy). - Age-at-maturity in northern cod has declined significantly (DFO, 2003). The tendency of fish to become mature at smaller sizes and younger ages is known to be a possible consequence of a declining food availability (Stearns and Crandall, 1984). - In recent years, scientists and fishermen in Newfoundland (and elsewhere in Atlantic Canada) have repeatedly expressed concern at the decline in capelin, traditionally the major, oil-rich prey of the northern cod. Scientific surveys on the Grand Bank suggest that a large decline in capelin abundance has occurred there. Capelin are also smaller now, on average, than they were in the past. - Accelerated natural mortality due to poor physical condition (post-spawning mortality) was believed to have been a factor in the sudden crash of the cod stock that occurred in the early 1990s, and which coincided with a short term dip in water temperature. Since harp seals are not growing bigger or stronger, this pattern suggests that their cod-prey are becoming physically weaker and increasingly unable to escape predation. In the earlier years, it seems most likely that the seals refrained from eating the larger cod simply because they could not catch them. The role of natural predators is to enhance the health of its prey species by selectively removing the weakest individuals. Adult cod slowed (or killed) by factors such as food starvation, extreme cold, or oxygen deprivation, would become easy prey for seals that they could have avoided had the fish been in better health. Why are the cod concentrated in Smith Sound? A relatively dense aggregation of Atlantic cod has persisted in Smith Sound, in an inner region of Trinity Bay, following the demise of the bulk of the larger offshore stock component. Why have cod persisted in this particular location? Faced with an environment that is producing ever-lower quantities of their food, a fish such as the Atlantic cod will make any and all possible adjustments that will enhance its survival odds. Besides slowing the individual growth rate, reducing body fat stores and reproducing at smaller sizes, the fish can be expected to contract its geographic range to the area that naturally produces the most edible material. Due to the nutrient input from terrestrial run-off, inshore locations such as Smith Sound produce somewhat more food, and will ultimately become the only remaining viable habitat for cod. But, as general food availability declines, susceptibility to death by ‘freezing’ in these relatively shallow, inshore areas can be expected to increase. This is because poorly nourished animals have lowered resistance to all physical stressors. What explains the timing of this particular fish-kill? If the immediate cause of the recently reported cod deaths was cold water, why did this occur in early April, and not in January or February? It seems unlikely that much heat remained in the surface water of Smith Sound during those winter months. This is supposedly explained by some vague “atmospheric effect,” but the factors previously discussed may be more important. First of all, fish with borderline energy reserves to withstand the intense cold would be expected to run out of energy and perish at the end of winter. However, the suddenness of this event and the fact that cod of many different sizes died simultaneously, suggests that some other environmental variable may have abruptly changed for the worse and contributed directly to their deaths. The following is speculation on my part, but it will be interesting to see what the final verdict of science is on the cause of this fish kill. A lack of oxygen in the bottom water of Smith Sound may have contributed to fatally ‘drawing’ the cod to the surface. It is now early spring. This is the time of year when daylight lengthens, seawater becomes less turbulent, and the ‘spring bloom’ of phytoplankton occurs in the North Atlantic Ocean. In this area, these blooms have been noted to be becoming more intense, although somewhat shorter lived, in recent years as compared to decades ago (Gregg and Conkright, 2002, DFO, 2000). The increased intensity of the ‘greeness’ relates to the fact that tiny algae are more numerous in the surface water. The loss of zooplankton can therefore be seen to contribute in multiple ways to disabling the ability of the ocean to sustain fish such as cod. Fishermen cannot be blamed for failing to see the zooplankton decline, but for DFO Science this seems to be inexcusable. 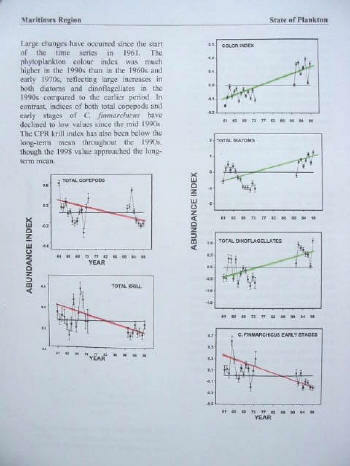 Graphs above copied from DFO SSR G3-03(2000), page 6. Click to enlarge. 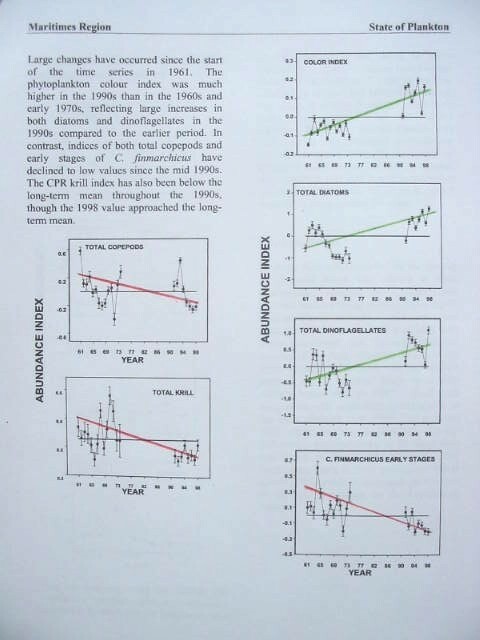 I have added the red and green lines, just my 'eyeball' linear regressions, to show the rising tendency of the three plant (phytoplankton) indicators and the declining tendency of the three animal (zooplankton) indicators. This interpretation agrees with DFO's text comments at top left of the page. My final observation is that the direct effect of seals on zooplankton is a positive one. Seals excrete copious amounts of live invertebrate (worm) eggs directly into the water. These little creatures ‘are’ zooplankton, and they are also eaten by larger forms of zooplankton. The entire assemblage of tiny planktonic animals is critical to zooplankton health and to the control and moderation of phytoplankton growth. Therefore, these, and the seals, are the last creatures that should be ‘excluded’ from Smith Sound. Even in a hypoxic bay, seals can survive, eat the dying fish and convert at least a portion of that food into live zooplankton, while avoiding some degree of the bacterial decomposition which would necessarily occur should many dead fish sink to the bottom. Thus an air breathing, zooplankton excreting predator, such as the seal, is in a unique position to help correct this type of unhealthy scenario. See also update on this story, April 11. For more information see Seals and Cod. For a look at starving cod in Nova Scotia see The Downturn of the Atlantic Cod. For a discussion on the role of spawn in the health of marine ecosystems see Fish Eggs: the Perfect Food? DFO, 2000. State of phytoplankton, zooplankton and krill on the Scotian Shelf in 1998. DFO Science Stock Status Report G3-02(2000). DFO, 2003. Northern (2J+3KL) cod Stock Status Update. DFO Can. Sci. Advis. Sec. Status Report 2003/018. FRCC, 2003. 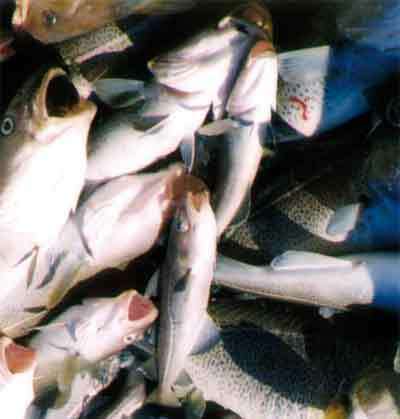 2003/2004 Conservation Requirements for 2J3KL Cod Stocks. Report to the Minister of Fisheries and Oceans. FRCC.2003.R.2. Stearns, S.C. and Crandall, R.E. 1984. Plasticity for age and size at sexual maturity: a life-history response to unavoidable stress. p. 13-33. In Potts, G,W, & Watton, R.J. (eds.). Fish reproduction: strategy and tactics. Academic Press. London.